This bead kit includes everything you need, except a needle, thread, and glue. Includes 46cm (18in) silver plated chain and brooch back. 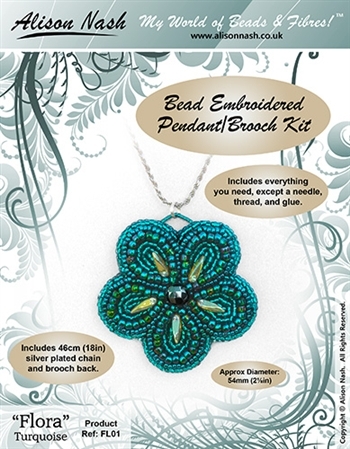 This kit is not for large commercial use, but you can make and sell up to 20 pendants/brooches per year. BEAD KITS > Shabby Chic Beaded Flower Brooch Kit - Blue BEAD KITS > Shabby Chic Beaded Flower Brooch Kit - Pink & Beige BEAD KITS > Bead Embroidered Bauble - Amber & Gold BEAD KITS > Bead Embroidered Pendant Kit "Midnight Blue"